Some of history's greatest minds have been entranced by Miami, the south Florida city that's equal parts beach party town, sprawling metropolis and steamy 'gator swamp. First: Since you're staying in South Beach (see “where to stay” below) you'll want to check out the action on the sand - but not without a little fortification first, right? Duck into one of the dozens of colourful art deco hotels jammed along Ocean Drive, otherwise known as “the strip”, and take advantage of the perpetual happy hour with a $15-$20 Miami Special: A tequila and blue Curacao slushy in an oversized glass with a couple of Coronas up-ended in the top. You might want to share it. Then: Assuming you're not too emotional after your breakfast cocktail, make like GOB and rent a Segway ($25 an hour from www.halfpricetourtickets.com) to zoom around the beach babes and volleyballers in pretty Lummus Park (Ocean Dr, between 5th and 15th streets) before lunch at Puerto Sagua (700 Collins St, at 7th St). This old-school Cuban diner serves traditional fare like empanadas (meat-filled pastry pockets), coconut shrimp and the try-before-you-die Cuban sandwich – roast pork, ham, swiss cheese, pickles and mustard on pressed bread. Later: Do some clothes shopping in the Collins St boutiques before grabbing a cheeseburger and a milkshake dinner at a traditional 1940s art deco diner (11th St Diner, 1065 Washington Ave, at 11th St, www.eleventhstreetdiner.com). Much later: Head back to the strip, pick a bar and order a cocktail bigger than your head. Repeat steps two and three until it seems like a bad idea. Then: Walk off brekky with a half hour stroll north to Lincoln Rd (www.lincolnroad.org), South Beach's top shopping district. You'll find plenty of ways to max your credit card in this beautiful, tree-lined pedestrian mall. Later: People-watch over dinner from the al fresco tables at De Luca (530 Lincoln Rd, at Drexel Ave, www.delucamiami.com), an Italian restaurant that's way more sophisticated than the menu prices suggest. Much later: If you can pass for a model or celebrity try your luck getting in to SET (320 Lincoln Rd, at James Ave, www.setmiami.com), one of South Beach's hottest clubs. Normal people can buy tickets to select events from opium.wantickets.com – but you better dress UP, or you'll be stuck behind the velvet rope all night. First: If you can't handle anything more than a coffee, get it from Pinocchio Italian Deli (8th Street at Ocean Dr), an authentic Italian hole-in-the-wall serving head-kicker espresso. Then: Cancel all your other plans, you'll be bunking down at Nikki Beach (1 Ocean Dr, at 1st St) for the rest of the day. 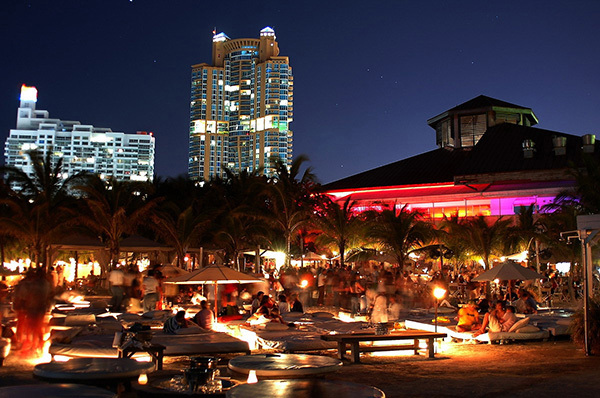 This sprawling restaurant/nightclub is the only one in South Beach that's actually ON the beach, meaning you can kick your shoes off and dance in the sand to some of Miami's hottest DJs. 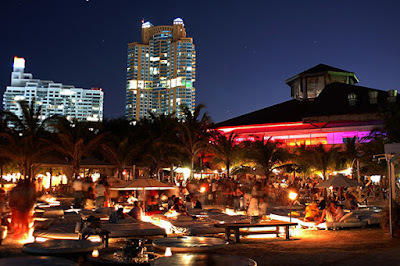 Sunday is THE day to go, so you might even see a celebrity or two relaxing in the cabanas ringing the sandy dancefloor. Head in about noon and stay til late. First: You know what goes great with a hangover? ALLIGATORS. Get up early and take a morning bus tour to the Everglades – the environmentally protected wetlands just 30 minutes out of Miami - and spend the morning whipping around the swamps on a hydrofoil, checking out reptiles. Keep in mind this will also give you a G-rated story to tell your parents when they say “So, what did you do in Miami?” ($39pp from www.halfpricetourtickets.com). Then: Head for SoBe institution Joe's Stone Crab (11 Washington Ave, www.joesstonecrab.com ) for lunch - but eschew the stuffy, expensive indoor dining for the takeaway outlet next door. Order the signature dish – stone crabs with mustard and butter dipping sauces – and take them to the beach to devour on the sand. Partygoers need only two things on holiday: A place to rage on, and a place to recover the next day. You'll find an abundance of both in South Beach, a flawless strip of white sand known located on the island of Miami Beach, east of Miami proper. If you're in Miami to party, this is your hood. Anything above 5th and below 11th streets will suit your purposes, keeping in mind the party quotient increases exponentially the closer you get to the beach, and decreases the further north you go. First published on The Vine, June 2012.